This is a restaurant I should have written about long time ago, though as many of you know, my blogging queue is sadly growing by the day. 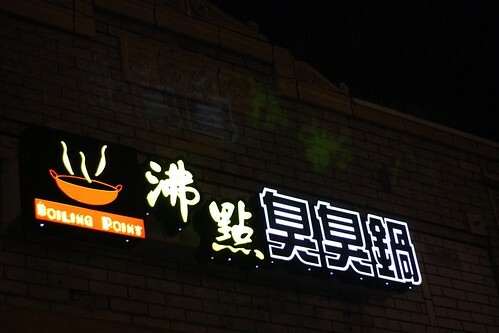 In regards to Boiling Point, it's a Taiwanese restaurant that specializes in personal hot pots, similar to the ones found at night markets in Taiwan. Having grown up in Taipei, and my yearly return visits back to the Motherland, visiting one of the many night markets in Taipei has become commonplace in my itinerary. 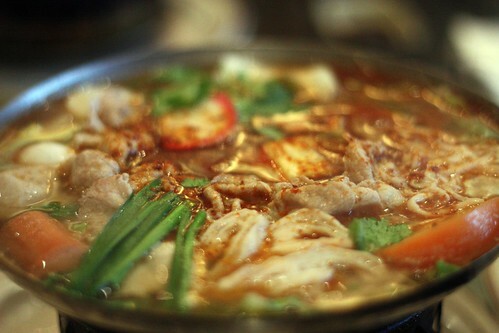 One of the more popular food stands, especially during the winter seasons are ones that offer personal hot pot like the ones served at Boiling Point. Though the prices will never be as cheap (or nearly as good) as the ones I've had in Taiwan, the lunch special at Boiling Point is quite a bargain for the amount of food given. 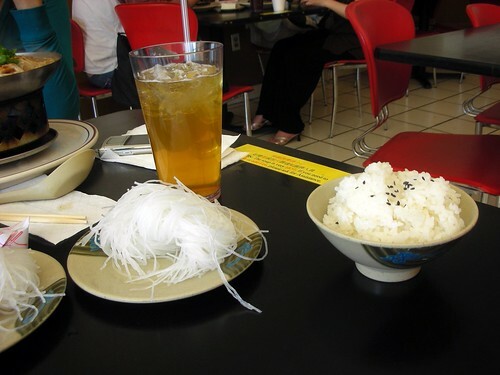 For $8.99, you're given your choice of hot pot, choice of rice/vermicelli, and a choice of soft drink or tea (no refill). Dinner time prices are $9.99 per pot, without the soft drink. Still, a pretty decent price. From the self serve sauce bar, you're given the choice of three sauces: chili sauce (normal, yet adds a nice additional spice to the hot pot and various cooked ingredients), spicy bean paste (a good alternative to those that can't handle the spice of the chili sauce with a subtle soy bean flavor), and finally, my favorite, the garlic infused soy paste (slightly thicker than soy sauce). 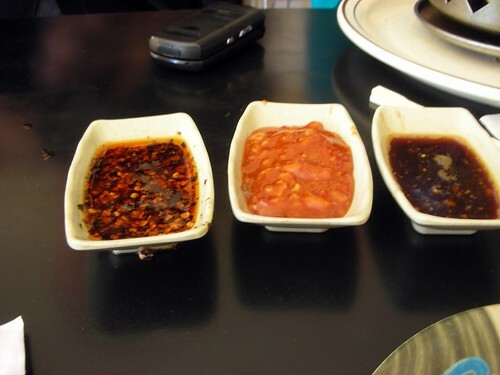 All the sauces adds an interesting flavor to the hot pot ingredients, I'd suggest trying each to see which of the 3 you'd prefer the most, or just mix 'n match. 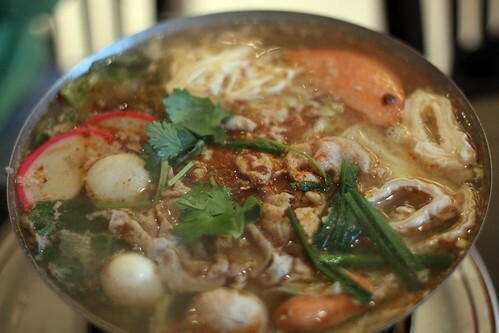 Now, Boiling Point does offer a few various hot pots. 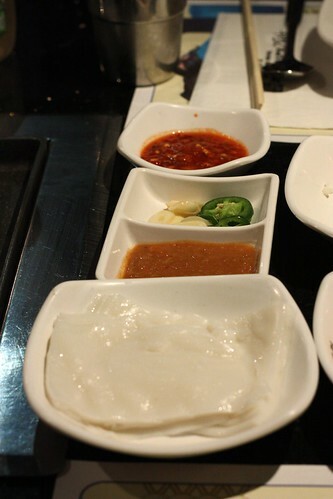 From vegetarian pot, seafood pot, to a Korean Kimchi pot, there are about 7-8 different ones to choose from. However, in my numerous trips to Boiling Point, the ONLY pot I've ordered was the House Special Hot Pot. With the numerious ingredients (quail eggs, pork intestines, pork, tomatoes, pork blood, and the most important item, 4 generous portions of my favorite stinky tofu amongst the items) in the pot, along with either rice or vermicelli, it's quite a hearty meal in this recent cold weather. Stinky tofu, especially with its name, can be hard to take in, as it was even shown on Andrew Zimmern's Bizarre Foods in its Taiwan episode. However, like with durian, moldy cheese, and even beer, it's an acquired taste. 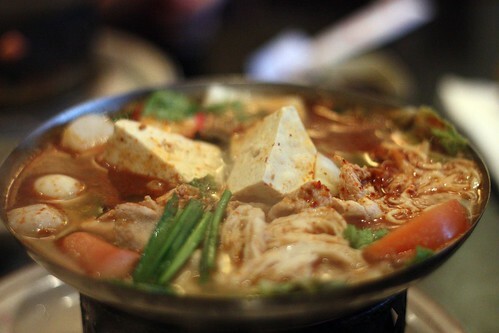 For those that are willing to try new things, disregard the smell of the restaurant (Yes, Boiling Point does stink a bit like Stinky Tofu) and try out the house special pot. However, for those that are less inclined, there are other options for you, without the stink! The pots comes in various spice levels. From mild to extra spicy, there's always a pot for everyone. Although I rarely would crave Boiling Point, eating here would remind me of eating at one of those Taiwanese night market stands, especially with the Taiwanese pop music in the background. Ah....good times! *Note* There is also a Boiling Point located in Hacienda Heights. 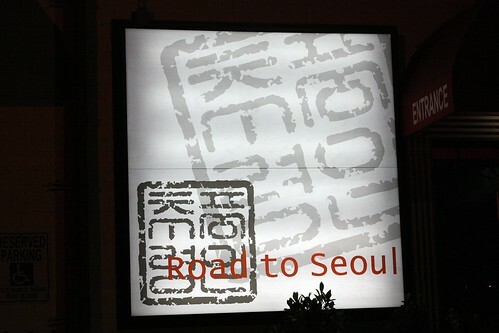 As I stated in my previous post on an AYCE (all you can eat) Korean BBQ restaurant in Northern California, Korean BBQ, especially the AYCE variety is quite prevalent in Los Angeles' Koreatown, and one of my favorite is Road to Seoul. 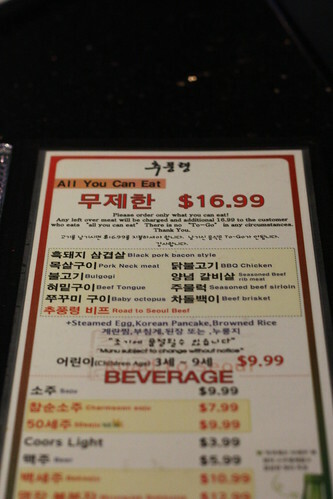 Compared to the prices in Northern California, most of the AYCE Korean BBQ found in Los Angeles are about $16-20 per person, and it could as little as $10/person, though I question the quality of the meat served at those cheaper establishments. 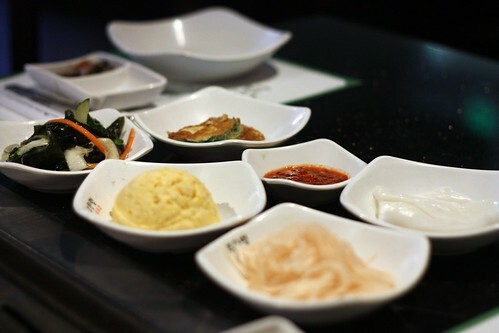 Above are the various panchan (반찬) served to our table. None of the dishes particularly stood out, though I did enjoy the potato salad as usual. 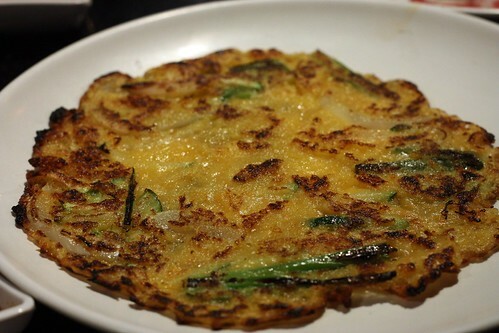 Along with the panchan, we were given an order of kimchi pancake, aka pajeon (파전), and an order of steamed eggs (계란찜). 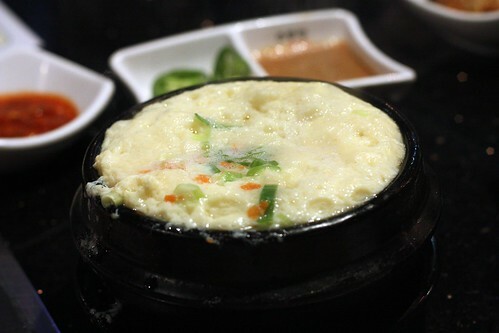 The steamed eggs, gyeran jjim is always one of my favorite things to eat, which is similar to the Chinese steamed eggs I'm known to make from time to time. The big dish of vegetable is often used to combat the meat to provide more of a "refreshing" contrast. 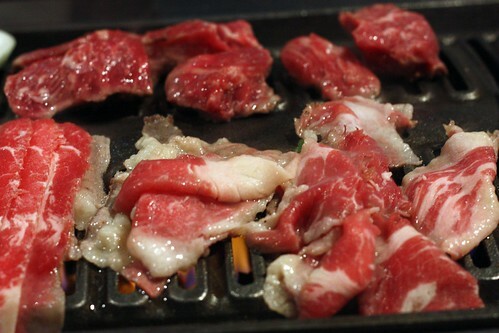 Above, I could go over each variety of the meat, but I'll let the picture do the talking for me. Everyone has their favorite meat selections. 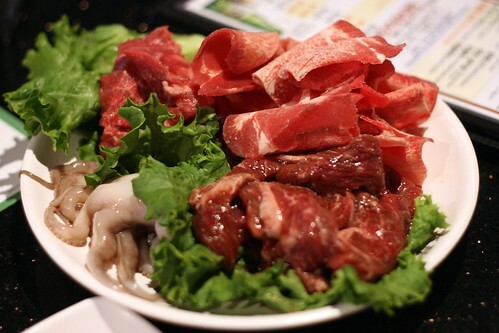 Some might like the kalbi and the baby octopus, some might prefer their chicken and beef brisket. 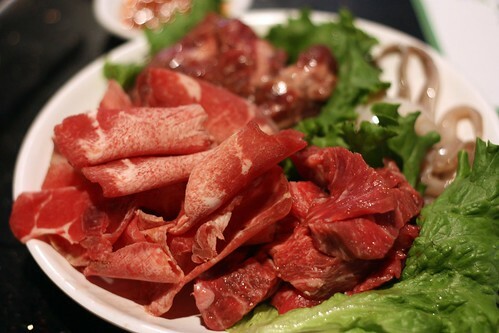 As for me, I love the beef tongue and the Road to Seoul Beef. The tongue offered here is tender and delicious. I often go through a few plates of that by myself. 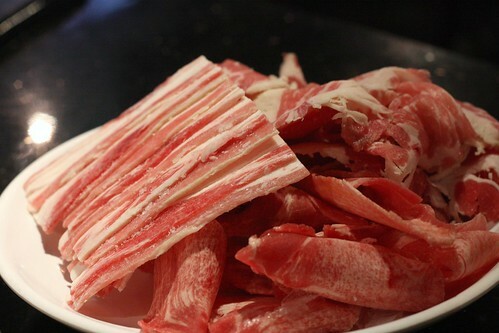 Along with the beef tongue, I enjoy the thin, fatty slices of the Road to Seoul beef. 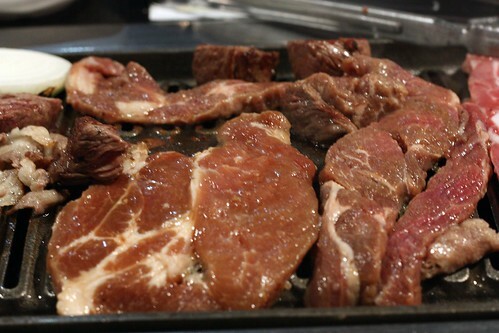 It's one of my favorite cuts of meat at any Korean BBQ restaurants. Delicious! 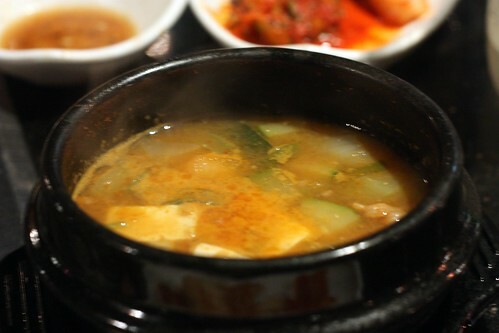 Upon the completion of our meal, we're presented with a pot of stew made of fermented soy beans called doenjang jigae. It might be slightly foul to some, but I usually enjoy a good pot of jjigae. 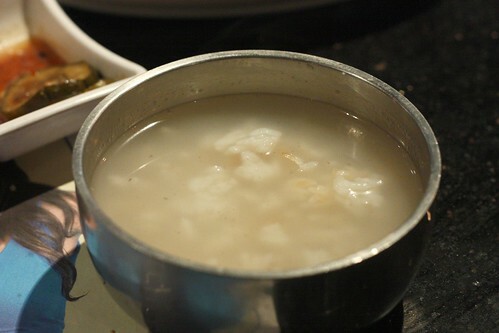 Along with the pot of stew, we're also given a burnt rice soup called noo reung ji (thanks for the translation Clara). 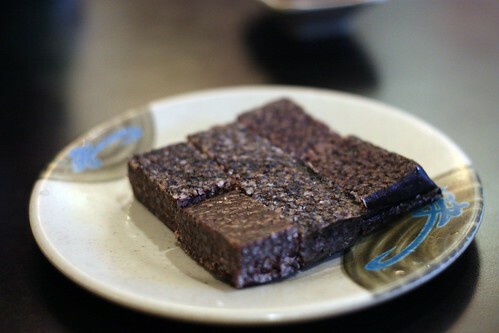 When eaten with soon du bu, it's quite nice, but I don't particularly enjoy eating noo reung ji after Korean BBQ. 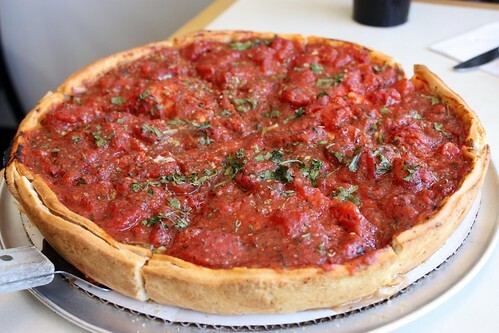 Zachary's, one of the most famous pizza restaurants in all of Northern California, is known for their Chicago style deep dish pizza. 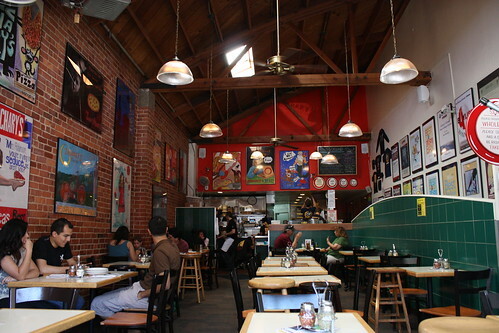 I've been here many times since I was young, as my grandparents resides in Berkeley. On a recently trip back to Northern California, I met with my friend Gigi and her friend Clarissa for a lovely lunch on the streets of Solano Avenue. We decided on getting a medium Zachary's special, which consisted of sausage, green pepper, onion, and mushroom. Even though they offered beer at Zachary's, we decided on some diet coke to wash down the deep dish. 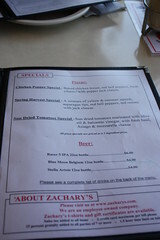 When the Zachary's Special arrived at our table, I was ready to eat! Even though the crust was thick, it was still crispy and had a bite. 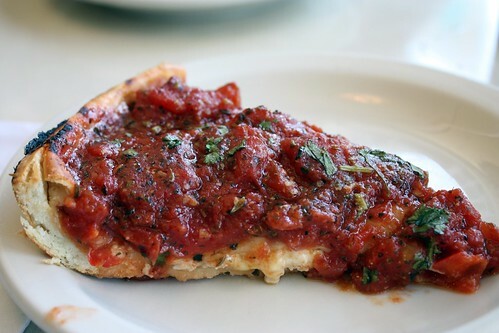 The tomato sauce was tart, and spicy, just perfect in my opinion. The mix of the chunky tomatoes, mushrooms, peppers, and onions harmonized with the italian sausages that were on the pizza. The pizza was simply delicious. At $24.55 for a medium, it might not be the cheapest piece of pie in town, but it more than fed the three of us hungry eaters, especially me, after my long drive from Los Angeles. 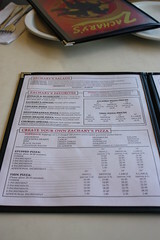 All in all, Zachary's pizza was one of the best pizza institutions I've been in my life. 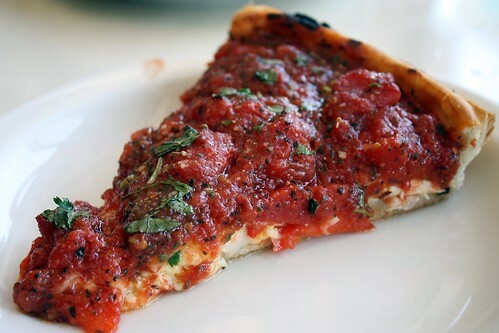 Personally, I prefer the thick crust of the Chicago style over the thin crust of the New York variety, though I hope I'll try a few good pizza slices in my upcoming New York trip. A Co-op, you can definitely see the employees are active and intended to run a successful establishment. 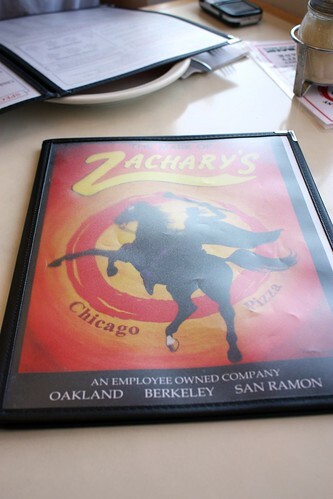 Even though it had been about three years from my last visit, Zachary's continues to deliver delicious pizza to its Bay Area clientele. 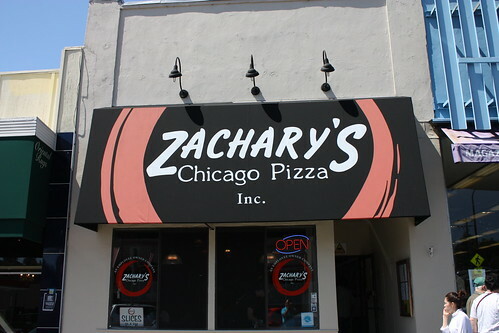 Although I was recommended to Cheeseboard pizza down on Shattuck, the nostalgia of Zachary's was too much for me to overlook. I hope for my next visit, there wouldn't be a three year gap. 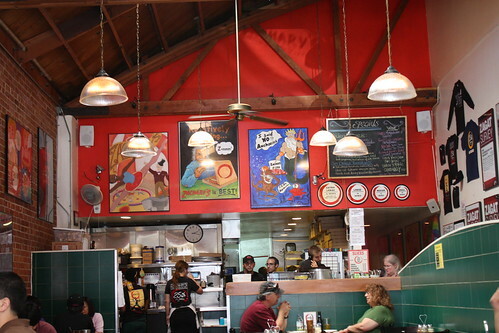 For any visitors to the "Yay" Area, make a stop at Zachary's, you wouldn't leave disappointed! *Note* Besides the Berkeley location, there are locations in Oakland and San Ramon. 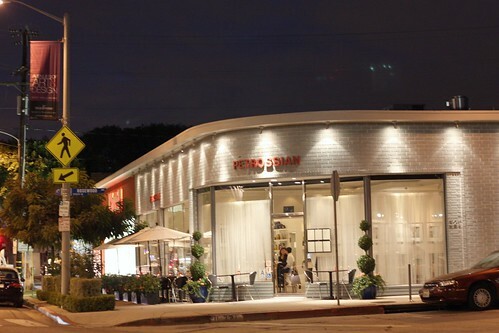 Petrossian, a caviar specialty shop that I honestly overlooked while browsing the dineLA list for 2009. Thankfully, to Jo of MyLastBite, I did not make that foolish mistake. I was about to embark on one of my best meals in 2009. Petrossian, as I stated above, specializes in caviar, but in addition to an online store, it has restaurants in New York City, Las Vegas, and West Hollywood. The West Hollywood location is headed by Benjamin Bailly, whose prior stops were at Joël Robuchon in Paris, L'Atelier de Joël Robuchon in Las Vegas amongst the many impressive restaurant on his resume. After browsing the dineLA menu online, I was intrigued with some of the dishes on the list. Count me in! 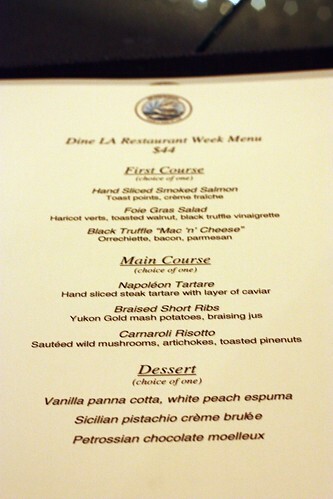 The dineLA menu is shown above. Quite an impressive selection indeed. My 2 dining companions and I decided to run the "gamut" and try all 9 dishes offered. 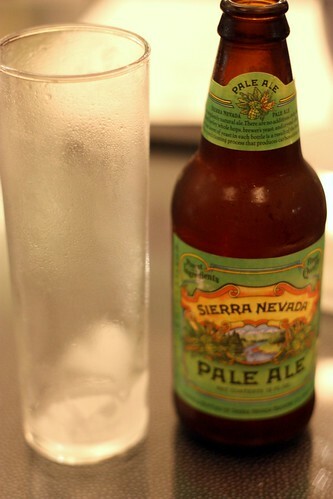 While waiting for the dishes to arrive, I went with a bottle of Sierra Nevada Pale Ale. Simple, refreshing, and a great complement to the meal I'm above to consume. 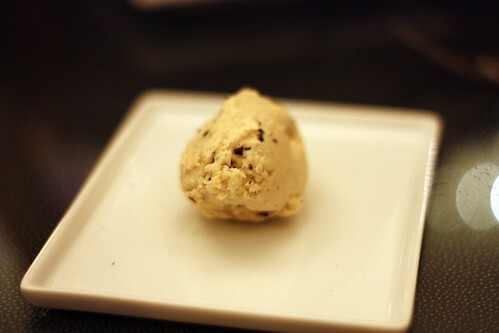 This truffle butter was amazing. Along with the bread (not shown) given to us, the truffle butter was simply delicious! 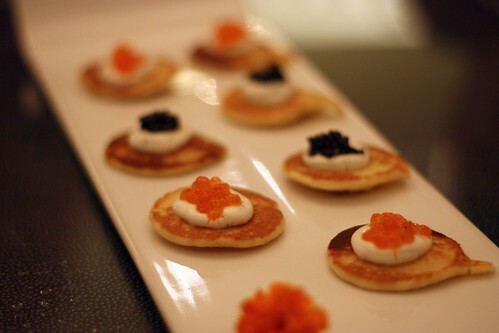 Here, Chef Bailly presented us with Blinis, which are mini pancakes made of buckwheat flour. Along which, a generous serving of sour cream was topped with caviar, and salmon roe. 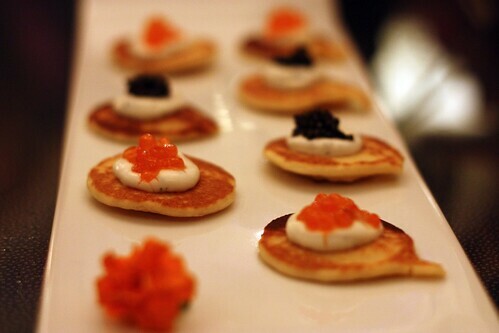 I enjoyed the saltiness of the roe, with the refreshing taste of the sour cream on the blini. Very nice start to the meal. 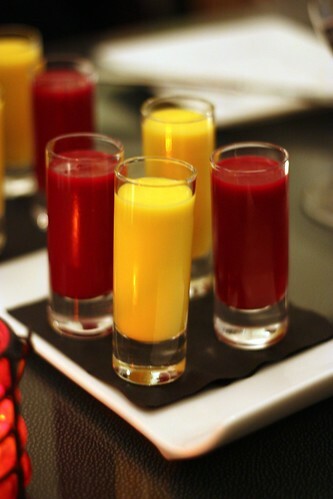 Next, we were given two types of chilled soup. First, the cantaloupe. The sweetness of the cantaloupe was quite nice, yet not overpowering. Next, the borsht, a famous Ukrainian soup made of beetroot. The flavors of beets were quite evident, and although I'm not too keen on beet, it provided a nice contrast to the cantaloupe soup. One of my favorite dish of the night. 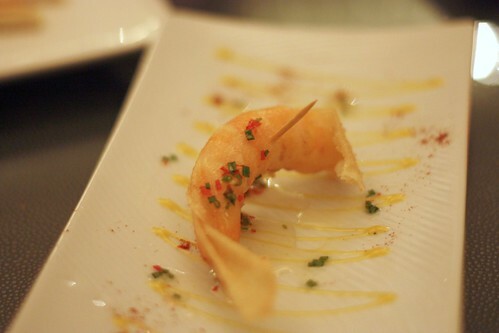 I thoroughly enjoyed the lightly fried shrimp with a sweet and spicy ginger sauce topped with a passion fruit topping. The shrimp was quite fresh and flavorful, and I loved the complex flavor that all meshed together. 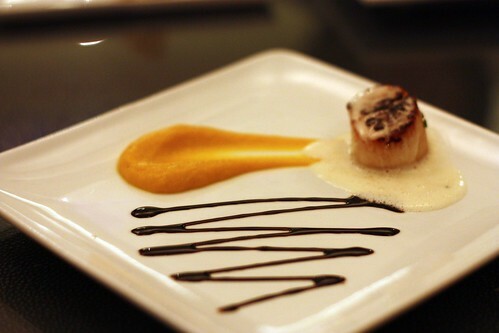 Here we have a seared, plump scallop which was presented with a butternut squash puree and a bacon emulsion. I enjoyed the pairing of two sweet, yet not overpowering ingredients in butternut squash and the scallops. 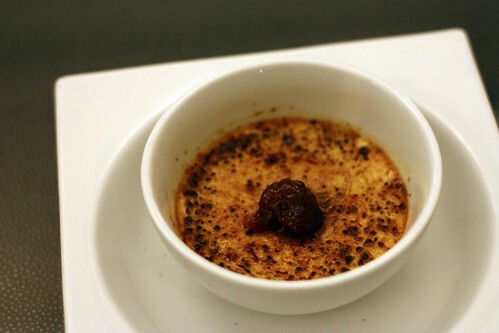 To those that know me, I love Creme Brulée and I love the richness in foie gras, so I was definitely excited when Chef Bailly presented us with the Foie Gras Creme Brulée. Even now, I'm not sure how to describe it. 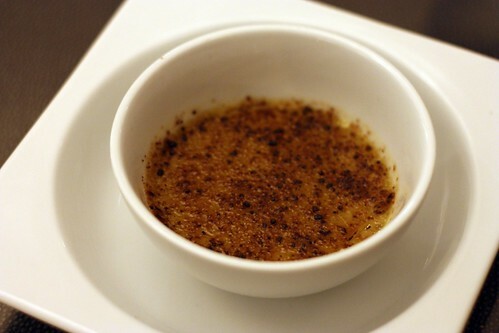 Maybe I'm too used to a normal Creme Brulée, so I wasn't used to the savoriness of the foie gras in the dish. I think I'll need to try it again on a return visit as I wasn't used to the flavor combination. 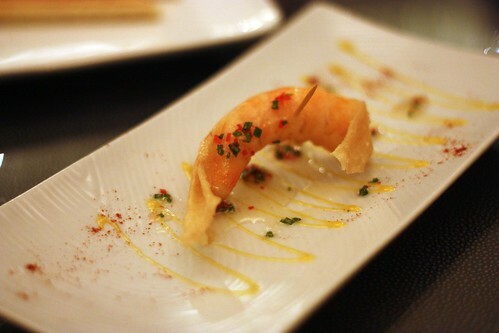 Here, we're finally starting on our dineLA menu, the appetizer course. 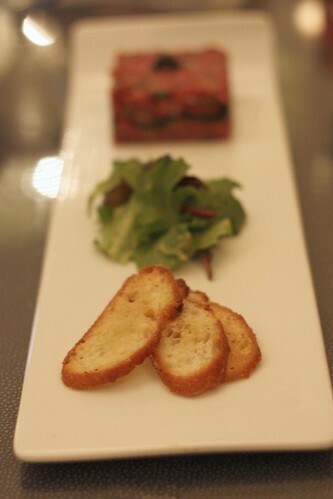 We started off with the foie gras salad with haricots verts (French for green beans), toasted walnuts topped with a thick and generous slab of foie terrine. 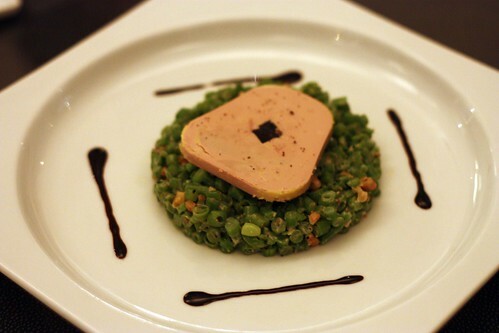 I really enjoyed the sweet flavors of the haricots verts and the rich taste of the duck terrine. 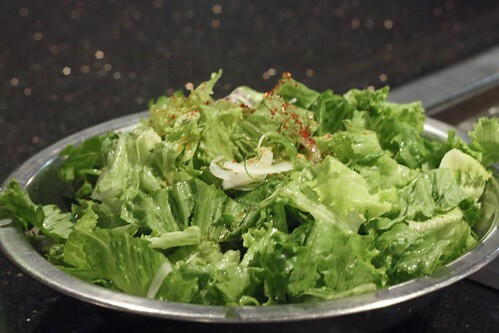 In addition, the toasted walnuts added a fantastic texture to this salad. Delicious! Here, we have probably the most simple dish of the night, but nevertheless, fantastic. 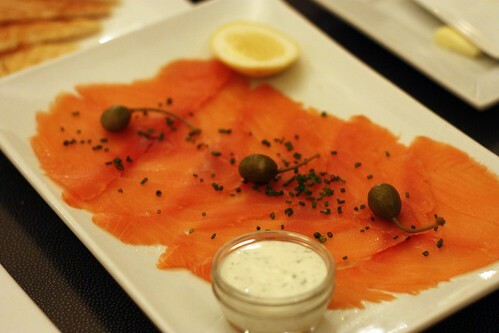 Presented, we have Petrossian's famous smoked salmon with chopped chives, capers and creme fraiche. 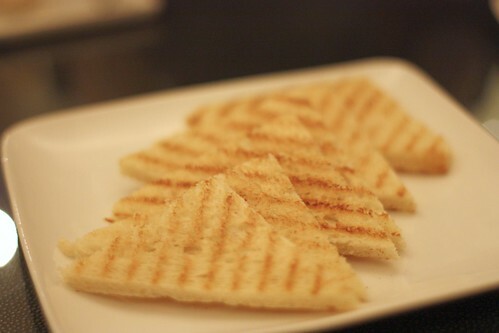 You would eat it with the toasted points (shown above) and as what it looks, delicious! The smoked salmon at Petrossian was one of the better ones I've ever had. Now, we have my favorite dish of the night. 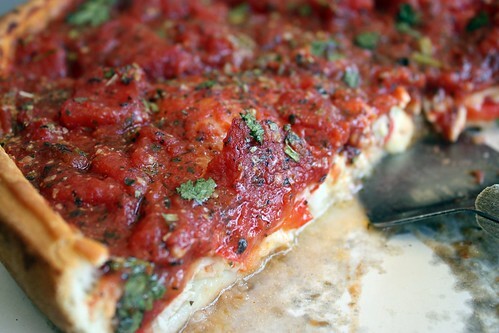 A dish I'm still drooling over as I'm writing up this post. Truffles in Mac 'N Cheese? Sign me up please! The pasta used here is the orrechiette, from the Puglian region that is shaped similar to an ear, hence the name "little ear." With the addition of truffles, bacon, and parmesan cheese, this pasta dish was simply awesome. 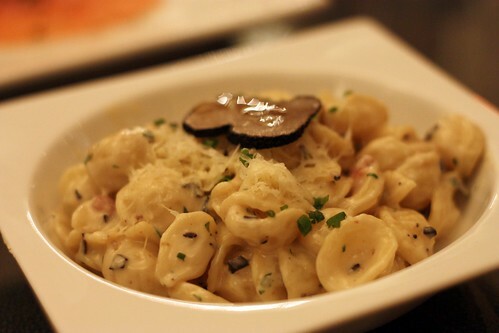 In addition, Chef Bailly generously added a nice slice of black truffle as an added touch. I can't wait to come back for this dish! 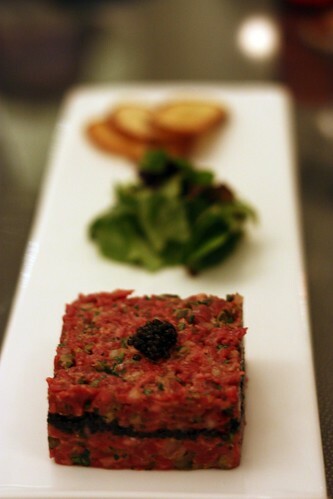 Another dish I was looking forward to, the steak tartare dish with an ample layer of caviar. 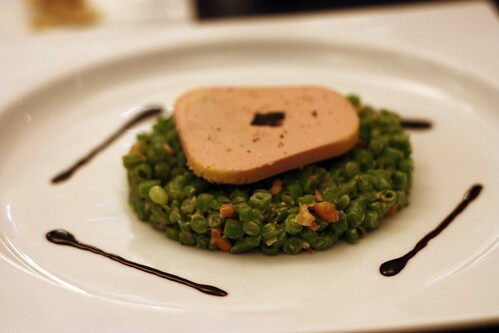 I was really interested to try the dish after reading Jo's first post of Petrossian. I really liked the delicately chopped beef with a fine, but generous layer of caviar. 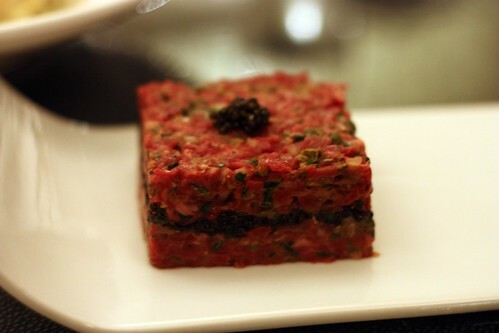 The saltiness of the caviar went beautifully with the finely chopped of beef. Great dish! The carnaroli risotto, made of carnaroli rice from Northern Italy was presented next. 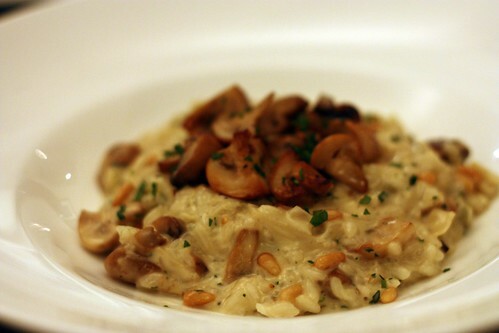 I loved the use of the mushrooms, which provided a woodsy flavor to complement the creamy cheese texture of the rice. The artichokes provided a slight tartness needed in the dish and toasted pine nuts added excellent texture. Very nice. By this point, I was stuffed from the previous courses (and from a lunch at Fogo de Chao), and the short ribs were next. 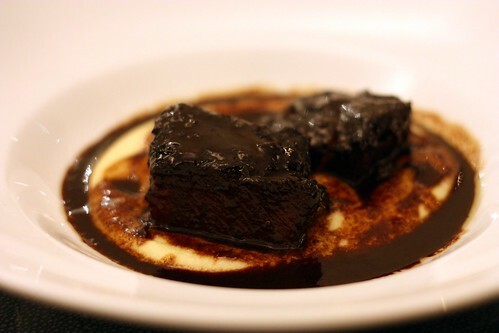 The short ribs were tender and flavorful, though it was slightly too salty in my opinion, which the mashed potato was a welcoming addition to the dish to combat the saltiness of the dish. Though delicious, it didn't stand out, but it could be due to me overloading on Brazilian BBQ earlier in the day. Finally, it was onto dessert. 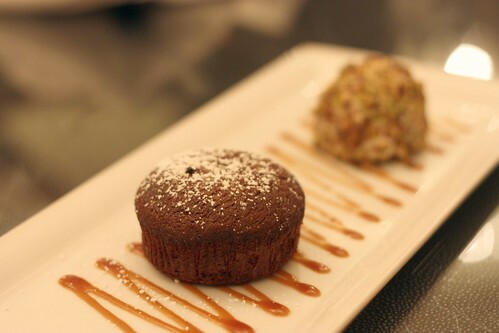 The dessert round started off with Petrossian's chocolate moelleux, which is French for a moist muffin. Eaten with the ice cream provided, it was fantastic. I originally feared this chocolate dessert would be too rich, but I was mistaken. Great start in the dessert round! Next, it's a pistachio creme brulée. Another one of my favorite ingredients in pistachio added to my favorite dessert in the creme brulée. This time, I loved the combination. Maybe I'm just not used to a savory creme brulée, but this was my favorite of the three desserts we had. 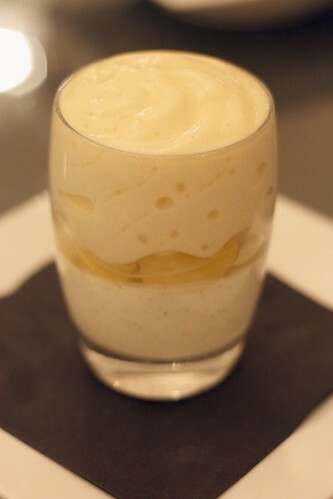 Finally, we have a panna cotta, a traditional Italian dessert made of cream, milk, and sugar. Added to the panna cotta was a tart peach flavor that served great as a palate cleanser, and a great finish to our meal. Excellent dessert! 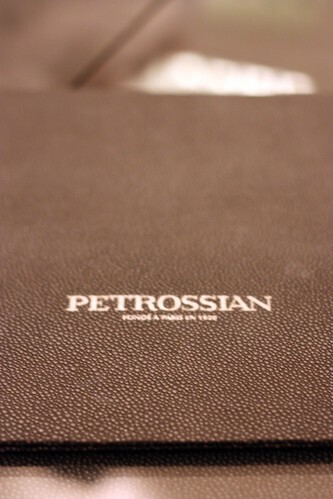 After our dinner, I was extremely satisfied and felt that Petrossian far exceeded what I was expecting going in. 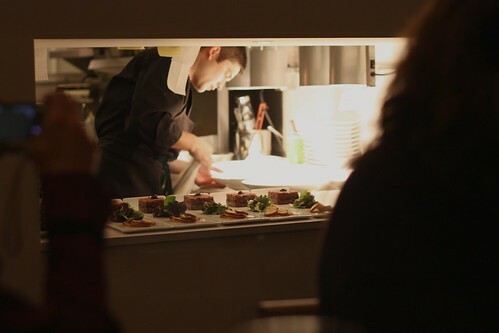 There were many highlights during our meal and Chef Bailly made our meal a great experience. As what Jo stated on her blog about Chef Benjamin Bailly, remember his name, he will definitely be a superstar here in Los Angeles, if not, the nation. Chef Bailly, don't forget, Truffles Mac 'N Cheese with extra truffles, please! I can't wait to go back.